This photo is from Moni who is an Alex fan who lives in Hawaii… lucky duck! Thanks for allowing me to post your personal photo! Ya”ll ! I have loved Alex from the begining :heart: & love H 5O. I want him to be happy. He’s a great actor !! Would love to see pictures of Alex & his son ?? Thx Tiffany & Moni – send more pictures !! also- Entertainment Wkly newest issue (w/ Harry Potter on cover).. their list of DVRing of shows… and um, H5-0 of top 5… w/ (I believe its)26.9. and um, a “Hawaii Five-0 Bingo Board”……(I believe thats what their calling it?). We already have the Event over here,no idea which station that is on for you guys. But I heard we will get H50 in 2011 on Australian Television. We had 1 ep of 3R’s that was it and it was the 2nd ep for you Ryan’s First Day. But alas not on my TV. I live in the Outback so don’t get all the channels the big cities get. I think Channel 10 buying it, I don’t get channel 10. I imagine the UK will buy it as well. Alex’s got fans all over the world. Germany, Spain, Italy, UK. Well it is expensive to make, more so than other shows due to filming in Hawaii. Just read on line from Television Business International that CBS sold all three of their new dramas ,. Hawaii Five O, Blue Bloods, and the Defenders to overseas markets at over 2 million dollars a show each…a 42% rise in profit!!!!! And more are to come. … Does that mean our Alex is out there with the top contenders or what?? Go take a hike all of you who try to cut down and make all sorts of ridiculous negative comments about 3 great shows most especially Hawiaii Five 0…. I watch them all…..they are great….but always and forever Alex and his crew will come first . Good luck, God speed and we LOVE you so much!!! Thanks Moni and Tiffany for the candid photo of Alex and the H5O team. It made my day! Sure Alex’s got a 12/13 year old son Saxon. He commented that he spends a fortune on bringing family over to see him. Saxon was at the BUP filing some of the time, also I am sure he’s been over to Hawaii. Amber Clayton the blonde ER Doctor in 3R’s. There was a photo of the two of them at the Wikiki beach premeire. Yes, Saxon has been to Hawaii. There’s a pix out there somewhere on the Web that shows Saxon and Alex on the H5O set. I forget where I saw it. Alex is dating Amber Clayton, she has accompied him on saveral occasions, she was at SOTB with him!!! Tiffany tell Moni, thanks for sharing and snap away! Candid shots are sometimes the best, loving them & you for posting it. It’s a great way to start the weekend, seeing the cast in beautiful Hawaii. Sometimes the best pix are the candid ones. Thanks for posting! Love the pic! Thanks for posting! for sure… of as to whatever it is that Alex is got in his hands… well… who knows but him… and too maybe Scott. many thanks for sure to Moni for taking the photo… and tiffany, thank you for posting… thanks! next monday’s called Mano… check it cbs.com hawaii five-0 .. & too tv guide.com tv listings too..
Looks like his reading somethng, his next lines perhaps Thanks one ver lucky duck Mona. Moni is definitely one lucky duck!! 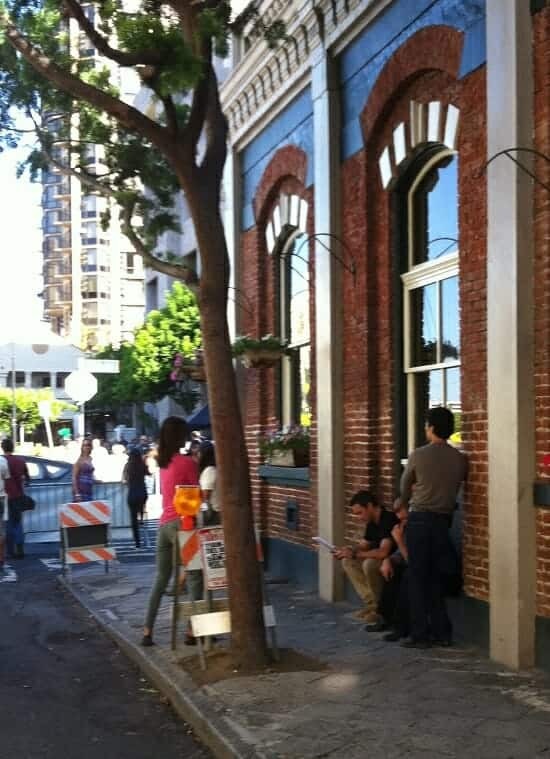 If I worked in downtown Honolulu and could see the H50 crew every week, I sure would lose my job in a hurry. I’d be out scouting the town to see glimpses of Alex constantly. Thanks Tiffany and Moni! We love any photos we can get of our hunky Alex!!! Comment :love: :heart: Thanks everyone for letting me join your updates on Alex I’m so excited to actually see his new show I was intense this last show when he almost got shot my heart stopped a beat or two hes so hot and i love his amazing eyes but seriously Id never have a chance at him buts thats all good hes still Hot!!!!!!!!!!!!!!!!!!!!!!!!!! Thanks Tiffany for the wonderful picture. Alex is so hot he could melt butter. I know he makes my heart skip beats. I am glad he takes care of his son. Yes a lot of actors and non-actors do not. Hope he has a wonderful relationship with Amber. Love ya Alex, you roc. From someone who will most likely never ever get a chance to see any of them from a distance, let alone up close and personal, thanks Moni for the beautiful picture!!! Any thanks Tiffany for posting it!!! Ladies, Alex broke up with his girlfriend last year so all you young women out there, he’s available! Sigh. And, I, too, respect him for being a father to his son, even though he did not marry the child’s mother. So many male stars don’t do what is right and I think it’s great Alex does. M L he has a new girlfriend. Her name is Amber Clayton. Yep, its true, Alex has a 12 year old son named Saxon from a previous relationship. He was not married but loves his son dearly and he has been to Hawaii to visit and Scott Caan, his dog Dot, and Alex play around togethe with Saxon when he’s with them. One of the many reason I love Alex….he is VERY family oriented and as said his son means everything to him. Alex is supposed to be dating Amber the blonde doctor who played opposist him on 3 Rivers…(the tearing off of clothes strike a chord??) She better be treating him right…he has a lovely house on Diamondhead. must be nice, not that he doesn’t deserve it. Alex does have a girlfriend, the actress that was on Three Rivers with him. Plus he is a single parent of a 10-11 yo boy. Rumors are that he is a great dad. AAwww. I wonder if he is happy in his personal life..? ?… I hope so..